If you think that buttons proclaiming your enthusiasm for one presidential candidate or another is a twentieth century invention, it may come as a surprise to learn that swag has been around since the time of America’s first president. 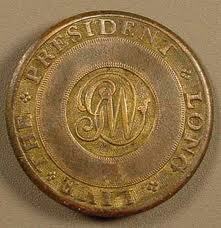 George Washington‘s political buttons were made of brass; in the center were his elegant initials, circled by the words, “Long Live the President.” The buttons were actually buttons, and were worn on the lapels. Buttons continued to be made from brass until the invention of tintype (also known as “ferrotype” or “melainotype”) in 1853. 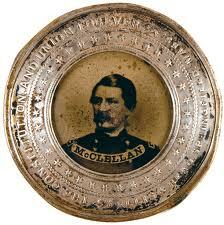 Tintype allowed a candidate to press an image of himself, or any other image, onto sheets of iron metal. Worn around the neck, a hole was punched into the top and a ribbon was threaded through. In 1896, “a patent from The Whitehead and Hoag Company of Newark, New Jersey brought about the political pins we know today.” Of course, today, “temporary” buttons, in the form of stickers, send the same message as their heartier cousins and are often distributed by the thousands at campaign rallies or in mass mailings. No matter what the form, though, the purpose of the campaign button has never changed: it shows other like-minded people the wearer is “one of them” and may help uncommitted voters be persuaded to join their cause. Here at eNotes, we hope you’ll pin on whatever button most appeals to you and exercise your right to participate in democracy. So get offline, get IN line. GO VOTE! Nice piece Jamie. We’ve been known to collect swag…just a little.